Scott took some time out, raised a family, got over writer’s block, but promised he’d return. This three track EP is the result. Those looking for a logical continuation from The Russians will hear some similarities to the previous project, but the bulk of this solo release is far less introspective. For upbeat new wave sounds, he goes all out on the title cut, mixing Cars-esque keys with a multi-tracked vocal and generally punchy approach. The squonky new wave keys threaten to leave the strongest impression, but the choppy guitars and strong vocal melody prove instantly catchy. A strong chorus joins the instantly likable arrangement to begin things with a slice of retro pop akin to Off Broadway (USA). More of the same provides the core of ‘The Worst’, a tune with a strong back line and simple melodic vocal. Between the strong melodies, more tinkly keys provide new wave distractions, but Scott wins out via another strong melody pitched against occasionally punchy rhythms. Both tunes provide great pop/rock, but it’s with the third track Scott aims to reel in his previous audience…and keep them. This short collection of material comes closest to revisiting the past on ‘The Big Reveal’, a slower number where sixties influences are channelled through a hefty set of rose-tinted 1980s specs. The over-riding sound is still that of many an early eighties new wave persuasion, but the arrangement – chiming as it does on the verses before exploding into a full chorus, perhaps owes as much to Phil Spector as it does The Cars and The Rubinoos. Jano’s multi-tracked voice has as much appeal as before, but it’s the blend of his fuzzy guitar lines and bell-like keys that really lend the number charm. The melodies are strong throughout and by the time he pulls everything to a close with another run through of the chorus and a couple of soaring guitar lines, you realise this track has been special – like a collaboration between The Russians and retro singer-songwriter Stephen Lawrenson. Once these three tunes are done, you’ll find yourselves hitting the repeat button. For those who actually heard The Russians LP, this will become a favourite…and chances are, very quickly. Since the gap between ‘Crashing The Party’ and this EP was so long, it’s a pity Scott didn’t leave more to keep his fans busy… Still, it’s good to have him back. 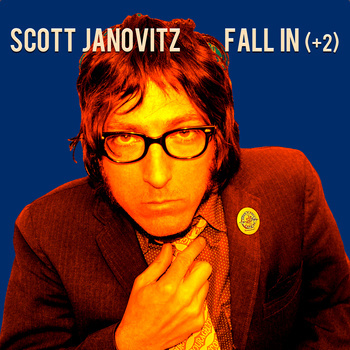 This entry was posted in Album & EP Reviews and tagged boston, power pop, retro, scott janovitz, singer songwriter, stream, the russians by Real Gone. Bookmark the permalink.